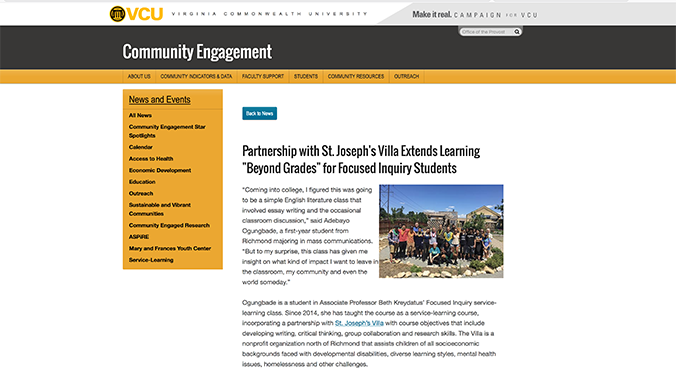 On ongoing series of feature stories in the 2017-18 academic year highlight community engagement and service-learning at Virginia Commonwealth University. View the story on the VCU Community Engagement website. Ogungbade is a student in Associate Professor Beth Kreydatus’ Focused Inquiry service-learning class. Since 2014, she has taught the course as a service-learning course, incorporating a partnership with St. Joseph’s Villa with course objectives that include developing writing, critical thinking, group collaboration and research skills. The Villa is a nonprofit organization north of Richmond that assists children of all socioeconomic backgrounds faced with developmental disabilities, diverse learning styles, mental health issues, homelessness and other challenges. The partnership connection was made through Kreydatus’ husband, Matthew Kreydatus, the director of career and transition services at the Villa. Through him, Kreydatus learned that the Villa needed mentors for its students. “I was interested in finding ways for my students to gain new opportunities for authentic and engaged learning, and we realized that we could collaborate and provide better learning for all of our students,” Kreydatus said. Now Kreydatus’ students spend two consecutive semesters working with the Villa, and by the end of their first year at VCU, they complete at least 40 hours of service. Kreydatus’ students visit the Villa on a weekly basis to offer mentoring and support to Villa students during their class days. Each semester, Villa students can earn up to five trips to VCU, where they participate in student-designed and student-led activities, eat lunch at the campus dining hall, attend Focused Inquiry classes, observe student presentations and participate in academic discussions or collaborative projects. Kreydatus said the partnership has helped introduce Villa students – many who may never have imagined themselves at college – to a welcoming college community. Kreydatus has seen her Focused Inquiry students benefit from the authentic audience and purpose for their work that service-learning provides. The outcomes “extend beyond grades” and result in students who are more invested in their learning. She said her students have gained professional skills and deeper insights into the community. The time they spend collaborating and speaking publicly before diverse audiences has helped them apply their classroom learning to real-world scenarios. Each spring, hundreds of Villa students and staff attend a Villa Block Party that is organized by Kreydatus’ students. And last spring, a group of Kreydatus’ students were invited to present to the Villa’s board of trustees about their partnership. Recently, students created a series of promotional videos that are used to promote Villa programs.